A dormer loft conversion is a great way to make the most of the space in your roof. Unlike standard loft conversions, a dormer loft conversion is a structural extension which extends vertically from the plane of the sloping roof. This creates additional headroom and space in what could otherwise be a cramped room – and the adding of dormer windows allows for a greater input of natural light for a spacious, airy feel. In the UK, the most common type of dormer conversion is a flat roof dormer. Not only is it the cheapest to build, it provides the most additional space and headroom. Shed dormers are similar in the fact that they also feature a single roof, though these slope at an angle shallower than that of the roof. Shed dormer conversions are usually used on properties with a gable roof. A gable fronted dormer is more attractive than flat roof or shed dormers. These consist of a gable wall extension built up to the ridge line, and a roof section building out to meet the gable. Similarly, hipped roof conversions feature a hipped roof for a more traditional look. As mentioned above, the flat roof dormer conversion is the cheapest to construct and offers more space so this is the most popular choice. However, if aesthetics are very important to you they may lack that look you’re after, so in this case a gable fronted dormer or hipped dormer may be more suitable – but be aware the amount of space they offer is significantly reduced. Whichever type of dormer loft conversion you choose, you’ll benefit from an increased amount of space and light in your home without the hassle of other space enhancing options, such as an extension or conservatory. And because heat rises, the cost of heating the extra room won’t be much more than your standard utility bill anyway. Most dormer loft conversions can be adapted to suit your individual taste and property, so be sure to give us a call on 0800 999 4034 to discuss your requirements. Most dormer loft conversions don’t require planning permission as they are classed as permitted development. However, extensions are limited to 50 cubic metres for detached and semi-detached properties, and 40 cubic metres for terraces. A good loft conversion company will advise you on the restrictions of planning permission, though if there is any doubt it’s a good idea to obtain a Lawful Development Certificate (LDC) from your local authority to certify that the development is lawful, should questions be raised later. 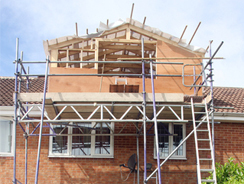 At Interloft we specialise in dormer loft conversions for a wide range of properties. With over 15 years’ experience and a professional team, we work with you to ensure the design of your loft conversion is exactly as you picture it. Offering a complete service from concept to completion, all our projects are complete within 6-8 weeks – and we work to the highest standards possible. Covering the whole Yorkshire area , we are the number one choice for loft conversions in Leeds, Harrogate, Bradford and beyond, so why not give us a call today for a no obligation discussion? Call 0800 999 4034 or fill in the form on our contact us page.